An early learning method for teaching writing to young hands is to help them learn the motions of creating each letter. Make a messy alphabet together to show your child how to write. Use instant pudding or shaving cream. Spread it on the counter. Use your finger to write a letter of the alphabet in the pudding or shaving cream. Have him trace the letter you made to feel the movement. Now let him try to duplicate the letter in the pudding or shaving cream. Learning how to write short words teaches him spelling and writing simultaneously. This is also a great way to teach him how to write his name. You'll need a steady hand, a word processing program or graphics software for this approach. Write or type out words you want him to learn to write as an outline. He will be tracing within the outline so leave plenty of space within the letters for his pencil. Begin with two- or three-letter words to keep it simple. He'll learn how to spell some of his favorite words and write them too. Buy a sheet protector from an office supplies store and a dry erase marker if you would like your page to be reusable. With a dry-erase marker, he can write within the lines, erase with a tissue and try again. Free alphabet printables encourage your child to learn the alphabet. He can begin tracing the letters and then fill them in with color. Use the letter for more than a few minutes of coloring. Encourage him to talk about words that start with that letter and which letter comes next in the alphabet. Draw dots in the shape of letters on a piece of paper. Your child will play connect the dots to form the letters. Dots that are fairly close together will help him use shorter pencil movements to learn how to write the letter. Be creative with your dots. With this method for teaching writing, you can dot up a page so that when the dots are connected they spell out an entire word. Have envelopes to address? Use a black pen to write out your addresses on a piece of paper. Write in big, bold letters so the address is easy to read. Slide the piece of paper inside an envelope to where it can be seen through the front. 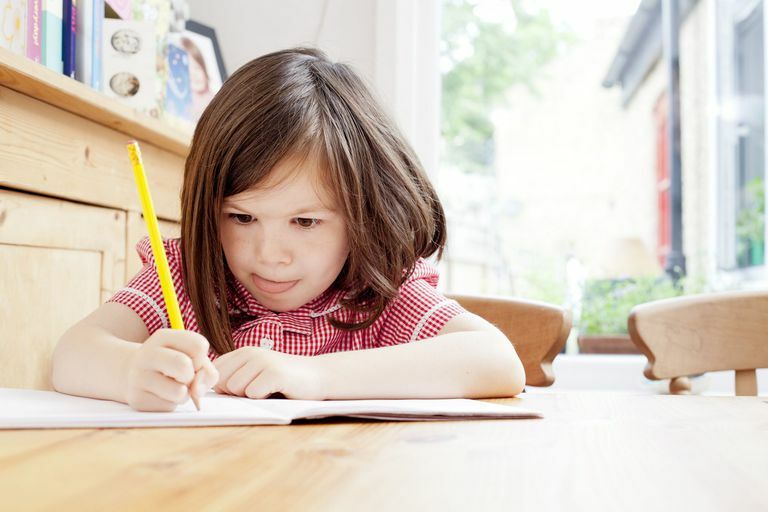 Let your child address your envelopes by tracing over your handwriting. You'll be teaching him how to write both letters and numbers at the same time. Thank you cards are an excellent step toward raising thankful children and teaching a preschooler how to write. Encourage your child to write thank you cards as they learn how to write. Kids don't have to write a long note. Just a couple of sentences help your child get to learn a valuable lesson on the art of the thank you, etiquette and writing skills. You can always add in some other activities to make thank you cards special so your child can look at this exercise as a fun way to show thanks while getting in some good writing practice. As you continue teaching preschoolers to write, you're not only having fun together, you're strengthening those handwriting skills. That first day of school will be a breeze because your child will already know her letters and how to write them.